2. Order columns by: Last Name, First Name, Student ID, Homeroom, Code, Email, Year. Leave the column blank if you don't plan to use that column. Codes can be generated later if you leave that column blank. 4. When saving: In "as type", instead of "xls" or anything else, choose "Comma Separated Value (csv)". 5. 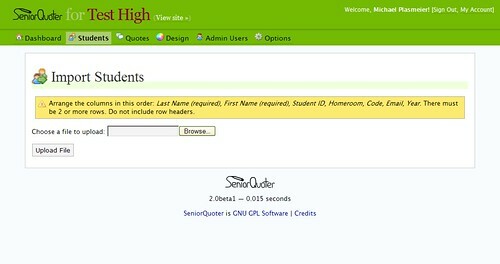 Open the SeniorQuoter Admin Panel: Go to "Students", go to "Import Students", and then upload the CSV file.